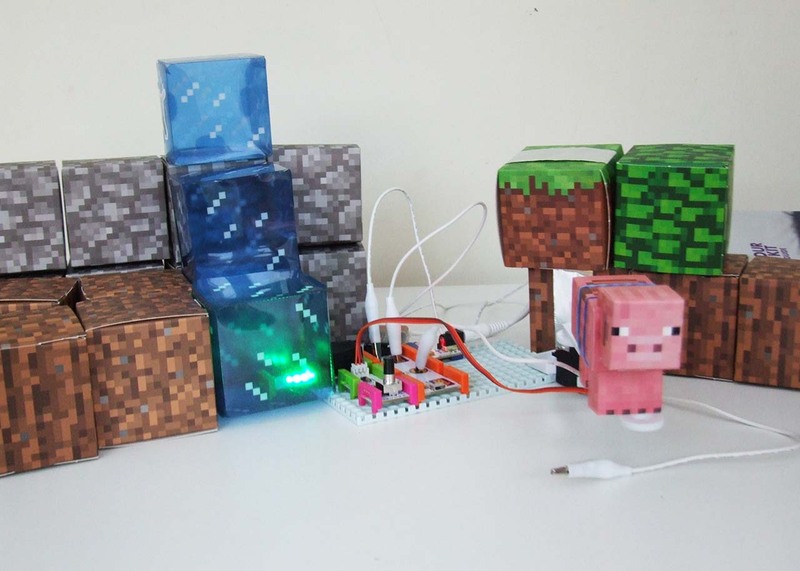 We've been exploring our littleBits Rule Your Room kit with our Minecraft papercraft world. littleBits lends itself nicely to craft with paper/cardboard and electronics adding movement, sounds, and lights to your makes. 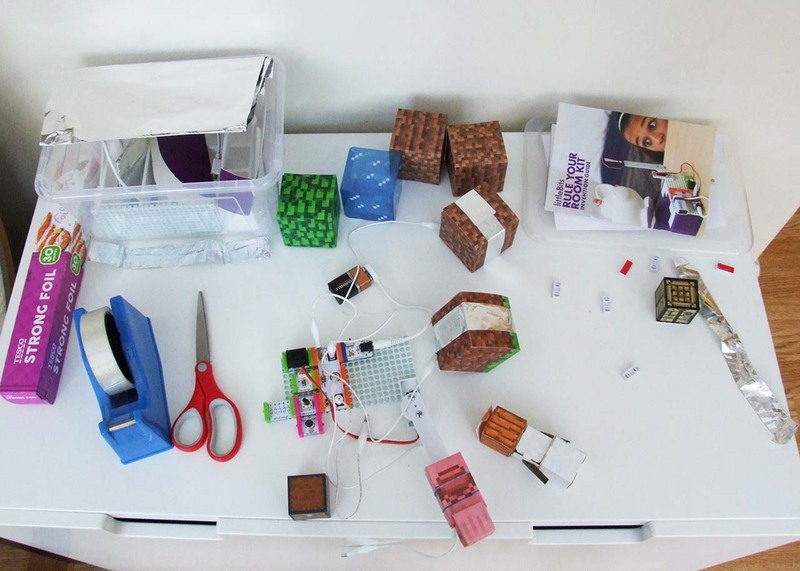 Read our first impressions review of the littleBits Rule Your Room Kit. The kit comes with a brilliant Inventions Guidebook, that gives lots of fun ideas for projects to make with the kit. When we started to explore outside of the kit guidebook, I was tempted to reach for our other bits. However, in this post, we only used the bits in the Rule the Room kit to show you what else could do with the bits. My youngest got a set of Minecraft Papercraft for his birthday last year. 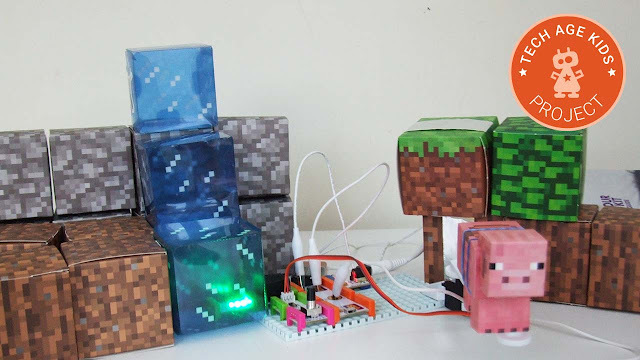 Our kids are huge Minecraft fans. I like the fact they can express that passion in a screenless activity too. 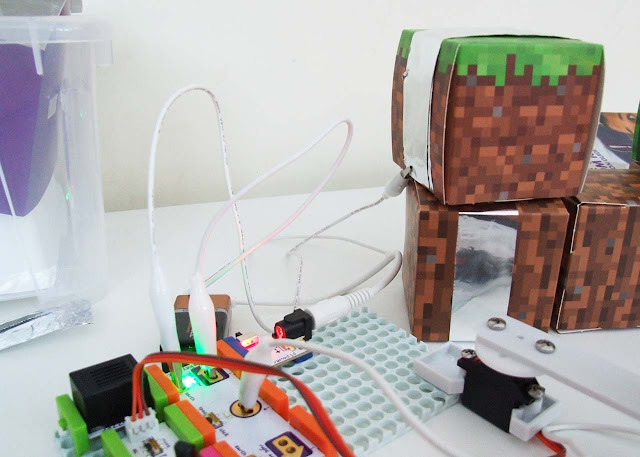 littleBits and Papercraft Minecraft worlds is a good mix. We played around with all the different bits, to create different effects. We added tin foil in the mix, to help make the papercraft blocks conductive. The kids discovered paper is NOT conductive. We made a switch using bits of tin foil and added some tin foil at the bottom of a crafting table. Every time you "placed" the crafting table something happening in our circuit. We attached a papercraft pig to the servo's mechanical arm using some loom band elastics which turned our Minecraft pig into a swinging animal knocking down boxes. In our snow biome papercraft kit, we had some ice blocks. We placed the bar graph bit with its LEDs inside the box. It created an appealing eerie look to our Minecraft world. Here I wished the Rule the Room kit had some wire extenders so that we could move the light further from the Makey Makey bit. 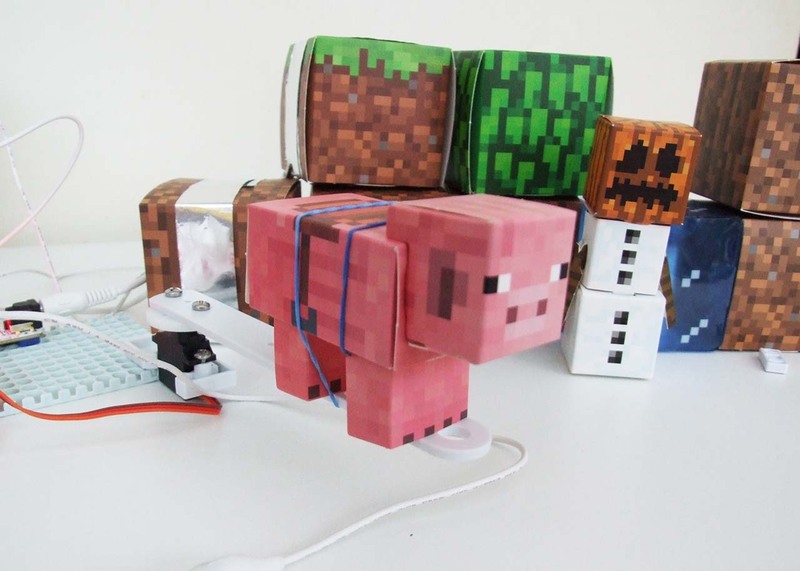 Our whole Minecraft playground used the Makey Makey. We experimented with different things, and the kids really enjoyed the experience. They made a switch using two boxes, which we used in our next idea! The Make Makey bit can be used as an external keyboard on your computer / laptop by connecting it with a power bit using the USB cable provided in the kit. The functionality is limited to only 3 outputs and you have to select between space / click for the input. 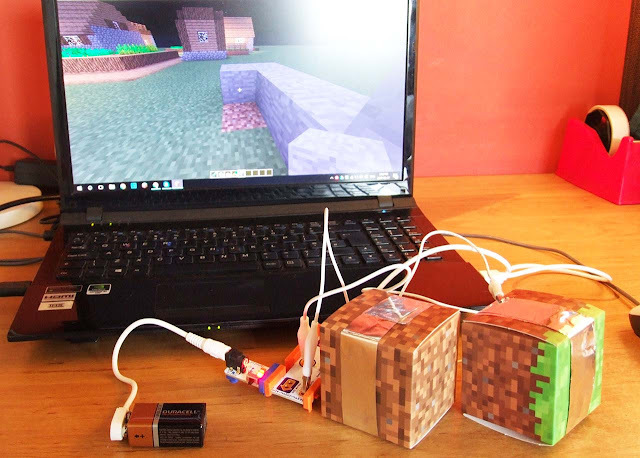 We thought is may be fun to use a physical block to place virtual blocks in the Minecraft game. 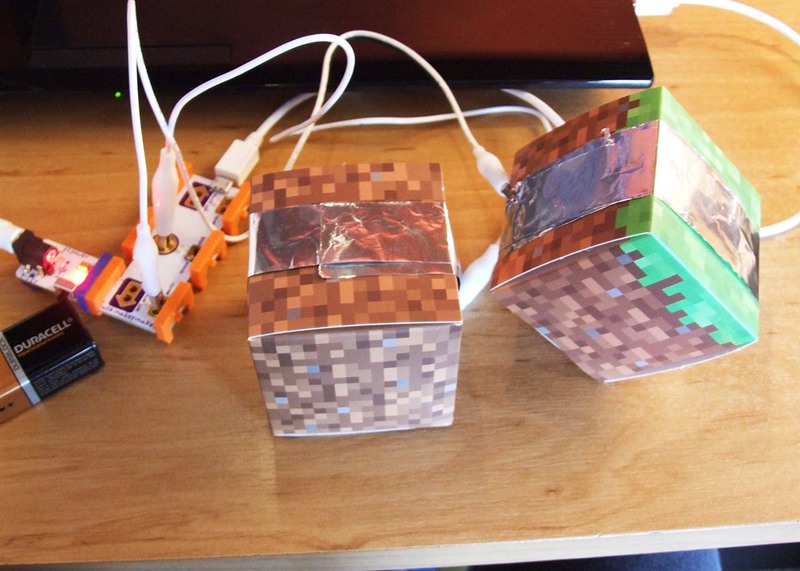 We wrapped some tin foil around two papercraft Minecraft blocks. We attached the one crocodile clip to each block, making sure to make a good connection with the tin foil. You have to clip one wire to the "earth" on the Makey Makey bit and the other to the space/click input. In Minecraft, check your settings and change the "pick / place a block" to "button 1". Now when you place one physical papercraft block on the other (making sure the tin foil touches) you will place a block in your game! How neat is that! ?